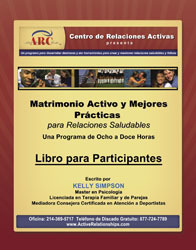 Active Marriage and Best Practices is a curriculum that is packed with how to's about what works in marriage. It includes communication and conflict resolution skills and skills for managing emotions, financial teamwork, negotiating challenges or extended and blended families and insight to keep love alive long-term. Sessions include lecture, discussion and experiential activities. This Spanish curriculum utilizes culturally appropriate examples, communication style and analogies.